Cumbernauld United boss Andy Frame has backed calls for the Scottish junior football season to be switched to the summer. In common with clubs throughout the country United have seen a host of fixtures wiped out this winter. And as the Scottish Junior FA prepares a paper outlining the pros and cons of a switch, Frame reckons there is no alternative. United are actually unbeaten in the league since mid-September - but have only played five games since then. 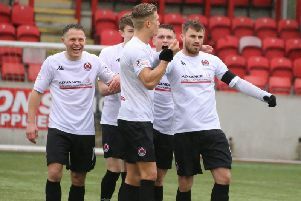 And with Guy’s Meadow being shared with Rob Roy, the pitch will face twice the fixture backlog and take twice the battering in the closing months of the season. Frame said: “For me it’s a no-brainer. I would be looking at a season running from maybe March until October time. “It would give us something to market. It would save teams money on training during the week. You wouldn’t have the cost of training, you would encourage more children to come. “It would open up fixture lists, you could have Friday night games. Imagine Cumbernauld v Kilsyth at Guy’s Meadow on a nice Friday night. It would just encourage so many more people to come. “The two or three games you do get on during the winter ruin the pitch and with the amount of games you have to play between March and May the parks take a hammering.